Save 30% on the Arapahoe | Hincapie Team Collection Thru April 28. This sport is in our head and in our hearts. Every day, we work to create premium quality apparel and high-end cycling experiences for you and other members of our community. Join the ride. Explore gravel roads and the Boise River Greenbelt by riding with us at Gran Fondo Hincapie-Boise. Combine your design with triathlon apparel that's ready for race day. Enjoy culinary creations from the nation's top chefs before Gran Fondo Hincapie-Chattanooga. 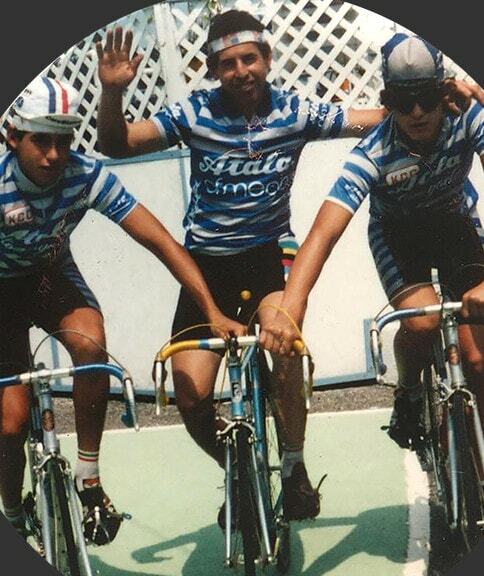 Like many cyclists, George and Rich Hincapie were introduced to bikes when they were kids. Unlike many cyclists, though, the boys took this hobby and turned it into professional careers. So, what began as a family passion continues to stay in the family—only this time as a business. Meaning values like loyalty, honesty, and love steer how we run the business, every single day. We don’t just make apparel. We ride in it. Because cycling defines every aspect of our lives. Whether it’s a lunch break ride with coworkers, events that bring in more than 2,000 cyclists from around the world, or the 17 yellow jerseys that line the walls of Hincapie HQ and George’s home, we know this sport. So when we say we know cycling, we mean we live cycling. We believe creating cycling apparel is an art. Every pattern, every stitch, every line and curve is studied and perfected. And before our apparel hits the market, we ride in it, and our team does too—12,000 miles a year, many times in extreme conditions. So when the piece finally hits your hands, rest assured that we believe in it.